Entering into the Church of St Ignatius (Rome) from the vivid sunshine of the street, its soft contemplative light, hallowed, invites stillness in the viewer. 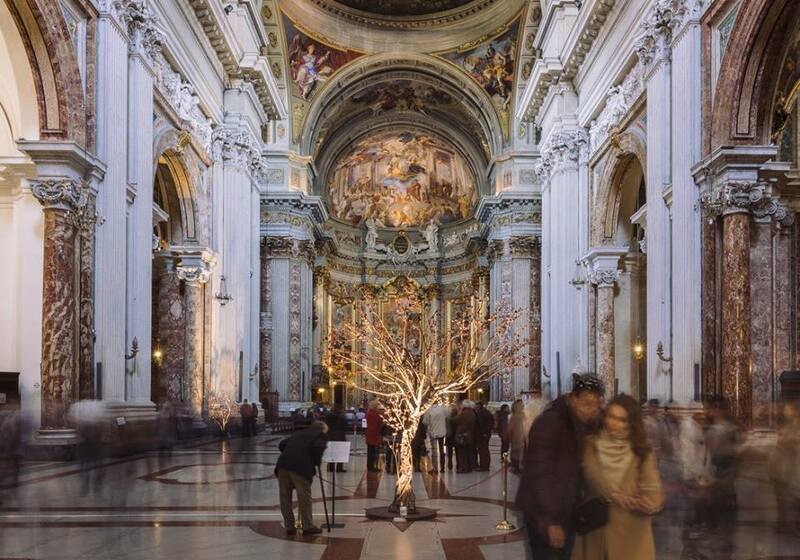 I'm drawn into the majestic domed nave of the baroque basilica, not only for the beauty of its richly ornamented altars or the frescoes on the ceiling ... but for the trees! 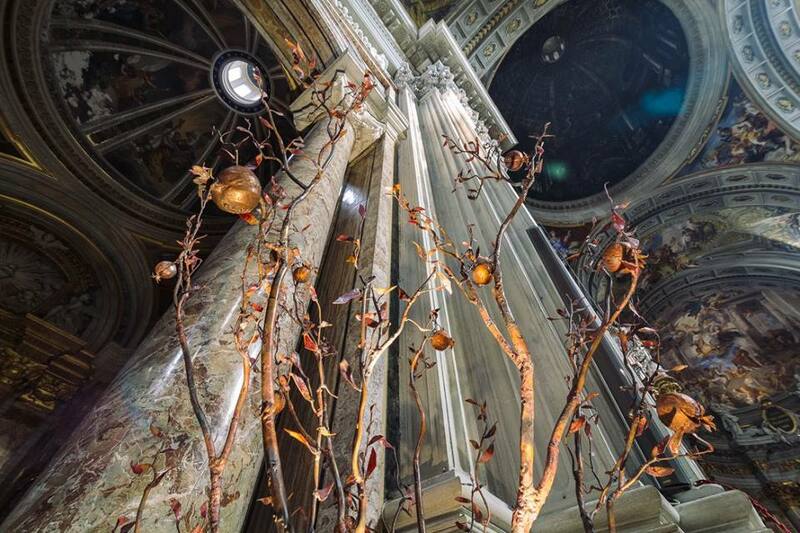 Copper branches glisten in the light, stretching up to the vaulted ceiling, twisted, contorted, of varying sizes and shapes, some endowed with fruit – apples, figs and pomegranate – others bathed in fire, referencing Moses and the burning bush. Sometimes give voice to confused words. Entering the sacred space of St Ignatius, meandering beneath the copper branches reflected in deep shadows upon the ancient basilica walls, I am reminded of the power of image and symbol to penetrate our hearts, reintegrating word and image. ‘And when image is done well, the image speaks.’ (Liviu Mocan). "Talk to me about God." Settimo Tamanini: Trees of Great Mothers - Fruit Trees from Palestine, 2016. 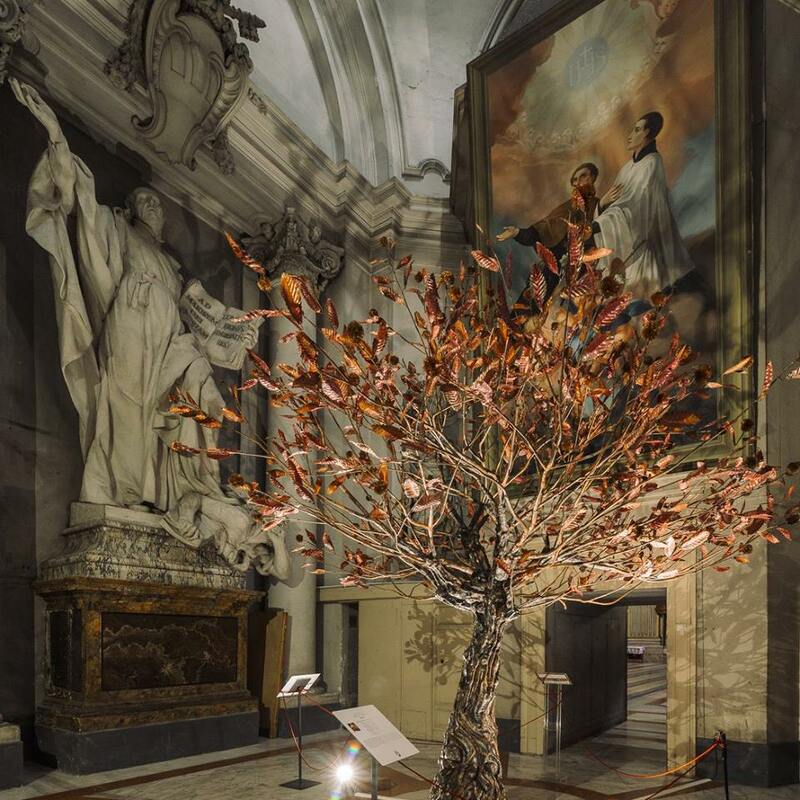 Alla Radici Della Vita / To the Roots of Life was shown in Church of St Ignatius, Rome from 18 February - 3 April 2016. Image 1: Almond Tree “Tree of Amazement”, 2016, pure copper blowtorched and forged by fire, 350 x 350 cm. 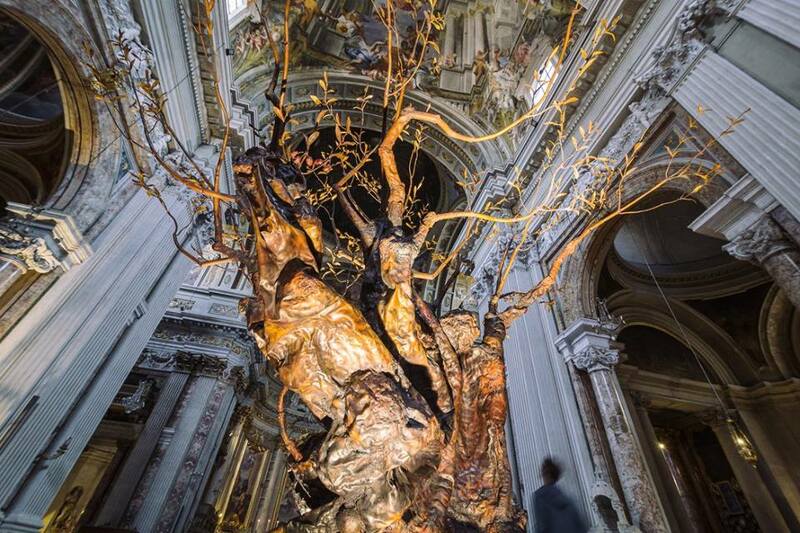 Image 2: Olive Tree “Gethsemane Tree”, 2016, pure copper blowtorched and forged by fire, 350 x 350 cm. Image 3: Pomegranate “Tree of Prosperity”, 2016, pure copper blowtorched and forged by fire, 300 x 200 cm. Image 4: Chestnut Tree “Tree of Generosity”, 2016, pure copper blowtorched and forged by fire, 500 x 450 cm. All images copyright © Mastro 7 by Pierluigi Cattani Faggion.